This weekend, the Spring cleaning bug kicked in full gear. I spent a fair amount of time staring at my garage. I fantasized about what I wanted it to look like. I can tell you that my garage is fairly clean thanks to my obsessively clean husband. 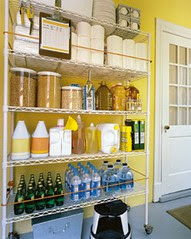 The problem lies in the organization of the contents in the garage. I happen to be the obsessively organized Queen of this family, but somehow, my skills have not reached the garage. I have a plan in mind. It's a good beginning, yes? I have learned from experience, that when I present these types of organizational plans to my husband, the said plans will need simmer time. I detest simmer time. I like to do things immediately, like a child. During simmer time, I will continue to fantasize. I would love to keep things off the ground... our shovels and rakes are all leaning against the wall. 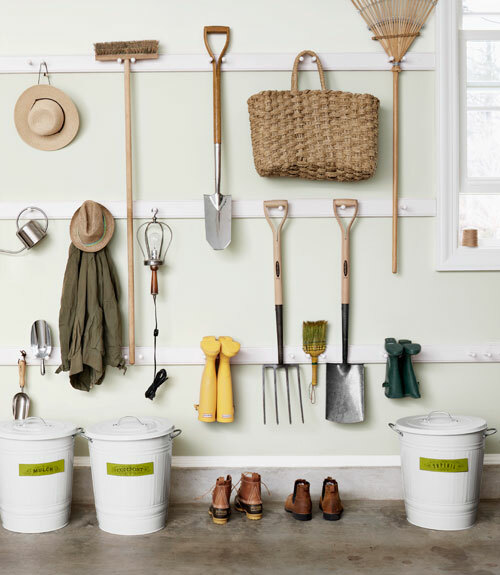 I also love the pails for mulch and soil storage... wouldn't that be convenient and tidy? This would be my favorite addition! I currently do my potting and plant arranging in my kitchen and make the biggest mess! Oh, to have this sink (or a counter top) and the space to make a mess and leave it! Plus the storage for plastic liners, extra moss, pots, and other containers... dreamy! This would be a nice space to store yard bags, birdhouses, candles and other summertime things that are put away for the winter. A cubby for each person with space for shoes, jackets, hats, etc. I would add a few cabinet doors for sports items, car items, etc. 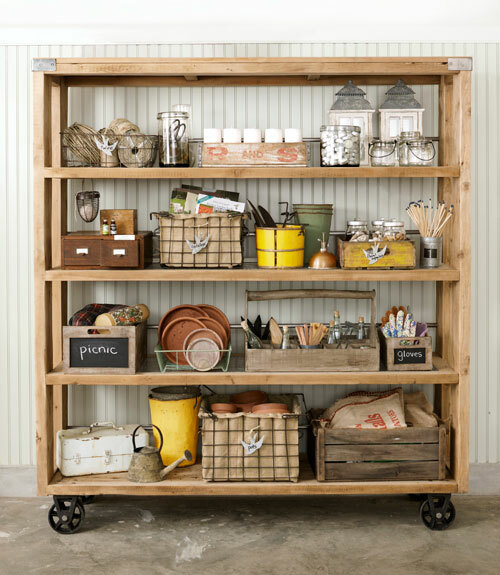 Right at the back door, this shelving unit would be great for the bulky extras you don't want to run out of! Isn't that a sunny idea to paint the garage yellow? I'm not sure my husband would go for it. I would love it! Hopefully sufficient simmering will be done in a short amount of time and we can get going on turning our garage into an organized haven where fantasy becomes reality. At this point, I'm grateful for the clean part. Now where did you find those photos of my garage? Sande, isn't it the most wonderful feeling? I like nothing more that DEEP cleaning closets and drawers... It's my favorite thing! I dream of the day when my garage looks this good! First step is the renovation in the fall.....these are great inspiration photos!! 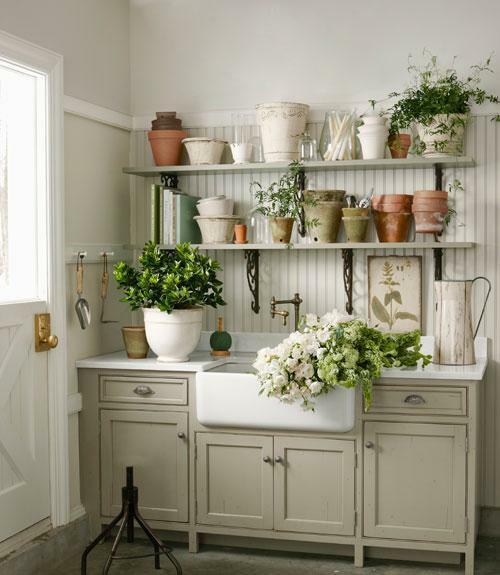 Wonderful photos, and I too am dreaming of the farmhouse sink...great for flower arranging!! Oooohhh...the sink area with shelves are dream delight!